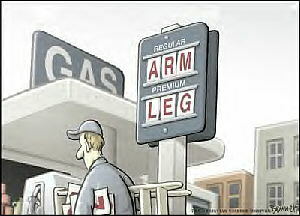 Our gas prices went all the way to $3.99 after Katrina. They have come down considerably this week. I saw a Marathon gas station that was selling regular for $2.45 today. They are saying that Rita will force the prices up again as there are many refineries, along the Gulf in Texas, that will be shut down by this latest monster storm. NOAA reports that Rita promises to be as bad, if not worse then Katrina. Global warming???????????? Paid 2.65 today at BJ’s.